Pig races, fireworks, parades, entertainment! Come celebrate our Independence Day with Fourth of July activities July 3-4 in Pequot Lakes. 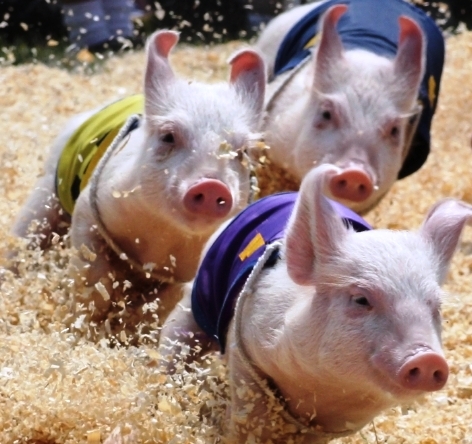 Back for year the second year, enjoy the July 3 pig races, followed by entertainment and fireworks! July 4 highlights include the annual parade! This two-day event is loaded with family fun events. Purchase your 2013 Souvenir cup at the Pequot Lakes Welcome Center for drink discounts on July 3 & 4 at area establishments. Participants included: Wendy Rickard, Sue Galligan, Cindy Fyle, Stacy Kittock, and Jane Munson. Stay for more than a day! Take in all the happenings with this event and more by extending your stay in the Brainerd Lakes Area. No other vacation destination in Minnesota offers the variety of lodging accommodations to fit every size, price, location, and style.